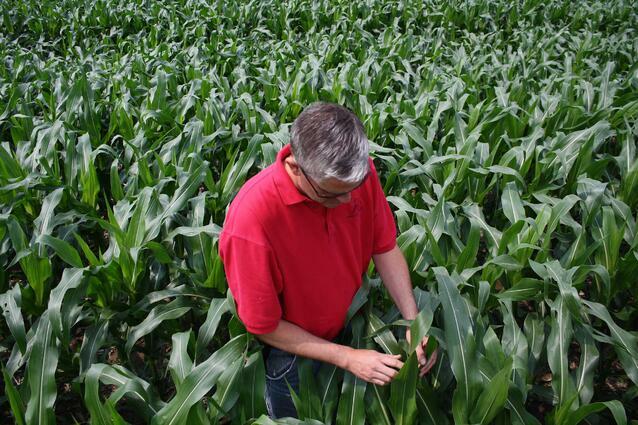 Ed inspecting his corn crop in. For those acres not impacted by hail, conditions have been very favorable. Farms like Hegland’s, located on the western Minnesota prairie, depend upon moisture in the hot months of June, July and August. This year the rains came, but that’s not the case every season. Hegland says moisture conservation is one of many advantages he sees to strip-till farming. “I think the strip-till handles the lack of moisture much better because there’s so much residue. I’ve read different studies that talk about anywhere from two to four more inches of moisture in a strip-till system over a season and that really adds up when you’re in some drier years,” Hegland adds. While his corn and soybeans soak up the sun’s energy, Hegland spends some of his time scouting those fields. A heavy flush of soybean aphids forced him to treat his beans for the yield-robbing bugs. Besides the winged pests, Hegland says stubborn waterhemp is becoming a problem in area fields. Besides walking beans and scouting fields, Hegland is beginning preparations for fall. That includes replacing coulters on his SoilWarrior that have worn after two years of both spring and fall use. That’s just part of the routine maintenance he does to keep his equipment in tip top shape. He has also scheduled an appointment with experts from Environmental Tillage Systems who will thoroughly inspect his machine, because when it’s time for fall harvest and field work, everything has to be ready to go. By late August, school activities are ramping up again. With three active kids, that means Hegland will have plenty of activities to follow. Despite being a busy time of year for farmers, Hegland says he knows the importance of being there for his kids, even with farm work waiting. “Right during harvest it can be a bit more of a push, but then again I’m not hiring someone else to go out and apply my fertilizer or hiring someone else to go out and do my tillage, I’m able to do that all myself and make sure it’s done properly,” he says. Listen to the full audio episode by clicking below or listen to podcast series. Fall is a great time to try a SoilWarrior on your farm. Contact us today to learn more about our on-farm demos, rental program, and 365 Test Drive with guarenteed buy back. Click the image below for details.